Escaping the Strait Jacket of "Place"
We like to think of "place" as something positive, something that sets our patterns of living in a good way, but sometimes those patterns and forms become a strait jacket that keep our communities from evolving and growing. Sometimes you have to throw off that strait jacket, and Seattle, where 150,000 people have moved in the last 20 years, seems to be doing just that. There, the planning commission, faced with finding houses for all those new people (and more to come), is looking at making changes to the single-family detached neighborhoods that have remained essentially unchanged for most of the last 100 years ago. Meanwhile, across the Sound in East Bremerton, officials are trying to turn around an area of the city that has been declining for the last 40 years, but their thinking, which treats the old highway there through a decaying commercial corridor as a sacrosanct feature of the landscape, will probably result in little more than ribbon cutting. Read on for a study in contrasts, of one place challenging convention and another bound by it. The proposed changes to the single family zoning code in Seattle are revolutionary, since, for most of the last 30 years, those single family zones have been immune to the upzoning that has occurred elsewhere in the city. With Amazon, Google, Microsoft and other tech companies all adding jobs in the center city, however, demand for more housing has pushed rents and prices through the roof. The city has tried to shoe-horn mid-rises and high-rises into downtown and old industrial areas, but even that is not enough to meet the demand. Many if not most of those places also lack basic public amenities like parks, schools, and green space. Now the Seattle Planning Commission has put out a report called "Neighborhoods for All" that argues that those old single family neighborhoods have become whiter and richer than ever, and that as an issue of equity and diversity, more types of housing should be built in them. This builds on a concept that Berkeley urban designer Dan Parolek calls the "missing middle": creating more lower-to-medium density housing that includes duplexes on corner lots, small cottages with shared parking, and courtyard housing like that built in the 1920s and 30s. 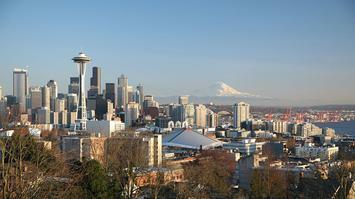 In progressive Seattle, arguments of social fairness can trump everything. Surveys by Forterra, a local non-profit, show that many Millennials want to stick around the city. That survey of about 1000 Millennials, many of them newcomers, showed strong concern about putting down roots here...that they don't view their tech jobs here as a short-term fling with the region. Two-thirds of all respondents ranked easy access to parks and urban open space as their top housing goal. Living in a neighborhood that is racially, economically and socially diverse is important to many of the respondents. Having a large house ranked last out of 13 criteria. This looks good for the development of small and compact housing, either attached or detached, but where to put all that? The single-family neighborhoods take up 70 percent of the land in Seattle, and those zones are now in the cross hairs of the planning commission. Meanwhile, ten miles across Puget Sound, the commercial corridor of East Bremerton and the neighborhoods around it have been slowly decaying since the 1970s. War time housing there, built to house tens of thousands of workers at the nearby shipyard, was meant to be temporary but is still in use 75 years later and it hasn't aged well. The highway corridor where everyone used to shop and dine has lost out to newer competitors ten miles north, and the local hospital, a source of pride, will soon move north as well. Local officials don't know what to do. They are still thinking of the ugliness in the corridor as an aesthetic problem, and not evidence of something more serious going on behind the curb line. Partly that's because they think of the highway in this corridor as a fixture in the landscape, something deep and immutable. And why not? This was the post-war place that everyone bought their first pair of running shoes, joined a bowling league, and celebrated a job promotion. Even the old restaurant chains like Arby's are still there. But not the new ones. There is so little new investment or retail interest that rents at one key intersection are literally the same as they were 40 years ago. Instead of thinking of this as a social, real estate or business problem, local government has instead hired a civil engineering firm to lead its work, which will most like result in proposals to "beautify" the highway. Banners and bus stops usually do little to increase the spending potential of a neighborhood, or how much of that spending stays local. Why do public officials so often take this approach? For one thing, it is how you get money from the state. Transportation money is big money, and funding big transportation projects creates security for public employees at both the state and local level. These old highways, features of the landscape, seem to be as durable and directive as the concrete channel of the Los Angeles River. Like that channel, people also tend to think in terms of their own department or service. It takes affluent young tech employees, threatening to leave Amazon or Microsoft to find cheaper housing somewhere else, to get government to question the old forms of place. Questioning the Forms and Sanctity of "Place"
There are not that many dynamic places like Seattle in the U.S. where the growth is so robust that the community are doing this questioning. There are many, many more "East Bremertons" in the world, formerly blue collar places, most of them not doing so well. Are these places doomed to decline? In my next article: how East Bremerton and old industrial communities like it can turn themselves around, not by recruiting an HQ2, but by drawing on their own strengths and rebuilding themselves from within. Rod Stevens is an urban revitalization and business development consultant based on Bainbridge Island, WA. He has particular interest in and has worked on several projects involving the revitalization of older urban industrial areas, including those in the Central East Bay and Sacramento.